The Honor 10i with triple rear cameras leaked last week, and now it's been unveiled for the Russian market. 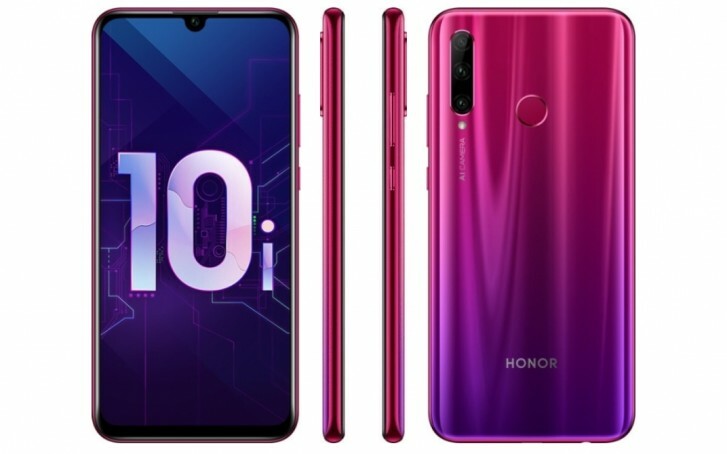 Despite having a lot in common with the Honor 10 Lite, this isn't in fact simply a rebranded version of that phone. The first and biggest difference between the two has to do with cameras. The Honor 10i has an extra sensor on the back, but it also boasts a 32 MP selfie shooter. The rear setup consists of one 24 MP f/1.8 sensor, an 8 MP f/2.4 ultra-wide angle snapper, and a 2 MP depth sensor. The device is powered by the Kirin 710 chipset like the Honor 10 Lite, but it's paired with 4GB of RAM and 128GB of storage - a combo you can't get in the Honor 10 Lite. Otherwise these are basically identical, sporting the same 6.21-inch 1080x2340 display, 3,400 mAh battery, and Android 9 Pie on board with EMUI 9 on top. Their dimensions are a perfect match too, although the Honor 10i weighs 2g more (possibly on the account of that additional rear camera). The price for the Russian market hasn't been announced yet, but local media expects the Honor 10i to cost at least RUB 19,990 - which means approximately $310 or €274. Hopefully the phone will be unveiled in more places soon, so we'll have official info on this as well. Is there any protection,some ip rating or gorilla glass?! Probably no,like always. Mp doesn't mean nothing.Is there ois,4k? Again,no.Kirin 710 is something like sd 660. Not bad but price is to high. + Is nice looking and 128 gb memory. Man there are too many variants these days. Honor V10, Honor 10, Honor 10 Lite, same with all the phones. It's out of control.